Parisian is known for their stylish live style since everything around them is always stylish and trendy including their French home décor. Everything that they did is always right from their fashion style to their home interior design. Sometimes we think it is very difficult to try and do what the Parisian did, but actually if you know the secret to do such style inside your house, then it is actually not very difficult to do. Let us learn a few tips and trick which you could easily apply to your house to achieve this kind of style inside your house. Parisian always thinks simplicity as the key for everything stylish and that is include the interior design that they use inside their house. To keep the interior simple they use neutral colors when they design it. That is why when you want to use French home décor for your house then you must keep your color scheme simple by using several neutral colors. You can also use complementary colors by choosing it with the help of color wheel. With this simple color pallet that you use, it will make your house balance so it will be able to keep you calm by the comfort. To insert the real French feeling inside your interior design you must use some antique French furniture inside your house. Try to visit your local antique store which may have several French home décor items from aristocratic era. Of course it might not be easy to find the real authentic antique French furniture so you can also use new furniture which inspired by the real antique French piece. You do not need to use French furniture for all of your furniture since you only need to put some as your house accent. That is why you can still mix and match your modern furniture with them if necessary. We all know that Parisian appreciate art a lot, that is why you must also induce art inside your house when you want to use this theme. By adding art to your French home décor design, it would become fun element which could balance out all of those serious feeling that the antique pieces brings into your house. And we all know that adding a few pieces or art inside a house will really complete the house design. You can try to use abstract pieces, black and white photograph, rough sketches or even your children drawing. 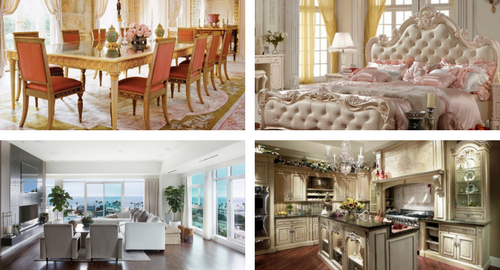 To add the luxury of French house décor into your house you need to insert several elements with gold and bronze. Of course you do not need to add real gold paint to your house but you can try to add detail of gold into the furniture. Antique furniture usually has some gold and bronze finishing so you might want to use that inside your interior. But if you want something simple, just add bronze hardware to your old furniture. With the addition of small gold and bronze detail into your interior design you will make it more luxurious. Parisian love comfort that is why they use a lot of upholstered items inside their house. Of course you also want to add some comfort to your own house, which is why you must choose upholstered French house décor items whenever possible. Try to use big French chesterfield sofa for your living room and add upholstered headboard to your bedroom. With those items you will feel more comfort and it also able to add more luxury appearance for your house. When you use French theme for your house interior the key is to mix and match everything. Since you do not want your interior to appear old but still you want to keep the luxury of old interior design, so you need to mix and match old and new items together. You can use a lot of modern items but try to insert several old items in your design as the accent of your French house décor room. Art is another thing that you need to pay attention as Parisian also appreciates art a lot, that is why you need to insert several art pieces in your house decoration. As accent you can also use several unique items which you find on the flea market. You should not need to worry since those kinds of items can also be considered as art pieces. As long as you know how to present the flea market items in an artistic way, then you will be able to make the piece appear more valuable than the real cost which you pay to bought it.